Membranous nephropathy (MN) is an autoimmune disorder of the kidneys characterized by thickening of the glomerular blood vessels surrounding the kidneys, granular accumulation of human IgG antibodies, and proteinuria. Autoantibodies against thrombospondin type 1 domain-containing 7A (THSD7A), a protein expressed on glomerular podocytes, have been observed in the sera of MN patients, though no direct causal linkage between MN and anti-THSD7A has been confirmed. Nicola M. Tomas, Elion Hoxha, and colleagues at Universitätsklinikum Hamburg-Eppendorf observed an MN patient who suffered disease recurrence following kidney transplant. This patient presented with elevated serum levels of anti-THSD7A before and after transplant and enhanced THSD7A staining in renal biopsies. The authors determined that THSD7A is expressed on mouse podocytes and that human anti-THSD7A recognized the murine protein, enabling evaluation of the link between anti-THSD7A and MN in murine models. Moreover, anti-THSD7A from MN patient sera and purified human anti-THSD7A were capable of binding mouse THS7DA in the glomerular capillary wall. Mice injected with MN sera exhibited increased granular staining of human IgG and albuminuria, similar to human patients with MN. To rule out another causal agent in the human sera, affinity purified human anti-THSD7A injected into BALB/c mice was also shown to induce histopathological characteristics of MN. In cultured embryonic kidney cells and human glomerular cells, application of anti-THSD7A prompted cytoskeletal disruptions, thereby altering both cell morphology and focal adhesion formation. Together, these results validate anti-THSD7A as a driver of MN. 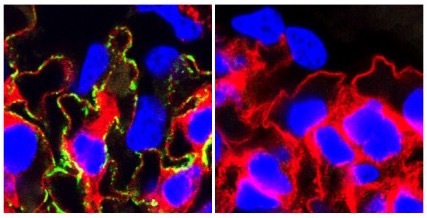 The accompanying image shows renal sections of mice at 70 days post-injection with either anti-THSD7A-containing serum from an MN patient (left) or control serum (right) and stained for laminin (red) and to detect human IgG (green), DAPI (blue). Note the presence of human IgG on the glomerular basement membrane of MN sera-treated mice in a granular fashion, similar to patterns of anti-THSD7A staining observed in MN. Citation Information: J Clin Invest. 2016;126(7):2519-2532. https://doi.org/10.1172/JCI85265. Membranous nephropathy (MN) is the most common cause of nephrotic syndrome in adults, and one-third of patients develop end-stage renal disease (ESRD). Circulating autoantibodies against the podocyte surface antigens phospholipase A2 receptor 1 (PLA2R1) and the recently identified thrombospondin type 1 domain–containing 7A (THSD7A) are assumed to cause the disease in the majority of patients. The pathogenicity of these antibodies, however, has not been directly proven. Here, we have reported the analysis and characterization of a male patient with THSD7A-associated MN who progressed to ESRD and subsequently underwent renal transplantation. MN rapidly recurred after transplantation. Enhanced staining for THSD7A was observed in the kidney allograft, and detectable anti-THSD7A antibodies were present in the serum before and after transplantation, suggesting that these antibodies induced a recurrence of MN in the renal transplant. In contrast to PLA2R1, THSD7A was expressed on both human and murine podocytes, enabling the evaluation of whether anti-THSD7A antibodies cause MN in mice. We demonstrated that human anti-THSD7A antibodies specifically bind to murine THSD7A on podocyte foot processes, induce proteinuria, and initiate a histopathological pattern that is typical of MN. Furthermore, anti-THSD7A antibodies induced marked cytoskeletal rearrangement in primary murine glomerular epithelial cells as well as in human embryonic kidney 293 cells. Our findings support a causative role of anti-THSD7A antibodies in the development of MN.